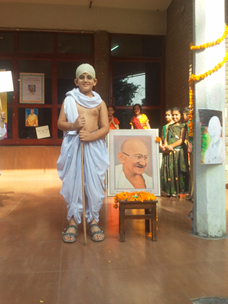 Patriotism peaked to coveted heights on 28 September 2012 at Amity International School, Noida,s Primary Wing when students of Class 4-J observed the birthday of the Father of the Nation, Mahatma Gandhi. After the prayer that added sanctity to the event, a brief historical account depicting Gandhiji,s life educated and delighted the audience focusing on specific incidents from his childhood. Placards helped a time line depiction of the life and times of Gandhiji. Vinayak Shridhar told a short stories tited, ‘Gandhiji,s Three Monkeys,. A poem ‘Jana, Gana, Sakar, was recited while the dance on Bapuji,s favourite bhajan, ‘Ragupati Ragav, had the children applauding loudly. The message, as also propagated by Dr. Amita Chauhan, Chairperson, Amity Schools underlined how Gandhian values in everyday life by being a role model living according to the formula of “see no hear no evil, speak no evil and see no evil" was been enhanced at the school. Meanwhile, Indian nationalism echoed in every heart. 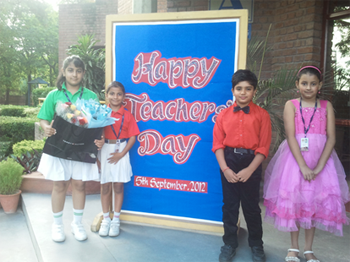 The Primary Wing of Amity International School, Noida observed Teacher,s Day on 5 September 2012 in recognition of Dr. Sarvepalli Radhakrishnan,s service to education. 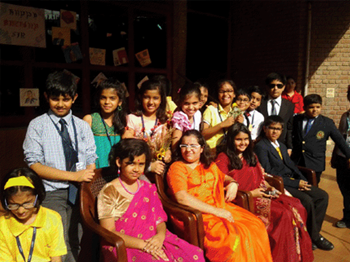 A series of special assemblies with children dressing up as their teachers and impersonating them happened on Campus, much to the delight of the Amitians. Principal, Mrs. Renu Singh thanked and blessed the students and urged her teachers to fuel teaching with passion, philosophy, values and ethics by facilitating the ‘Gurukul System, to today,s current life and trends. She always read out a message of gratitude by the Dr. Amita Chauhan, Chairperson, Amity Schools, while Mrs. Roopma Singh, Primary Consultants also expressed her gratitude to her Amitians. Later on, Dr. Mrs. Amita Chauhan, Chairperson, hailed her Amitian teachers and authentically praised them for their contribution in shaping her Amitians. She gave them an immensely thankful heartfelt message for being dedicated and resilient. Meanwhile, Chief Guest Speaker for the day, Brigadier (Retd) Chitranjan Naresh Sawant, VSM, accompanied by his wife, Mrs. Sudha Sawant graced the Teacher,s Day celebrations and lit the ceremonial lamp along with Chairperson, Dr. Mrs. Amita Chauhan and Principal, Mrs. Renu Singh to the chanting of auspicious Shloks. Brigadier Sawant gave an invigorating discourse on the tenets of the Vedic Dharma and talked briefly about the liberation of the soul as he motivated the teachers to do their dharma courageously. He also presented and autographed his book titled, VEDIC THOUGHTS to Amita Ma,am. 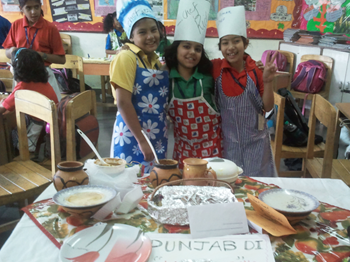 The AIS, Noida Primary students from classes 3 to 5 held the PLAN-A-SNACK competition on 26 September 2012. The main theme for the fun and innovative event was based on nutritive snacks having the local 'Delhi, flavours. The snacks were served in creative displays using garnishing, table ware, fun plates, cups, straws and the event culminated in a ‘tasting party,. Chairperson, Dr. Amita Chauhan is desirous that all her little Amity are symbols of ‘healthy bodies residing in healthy minds. During the event, the children learnt that serving healthy snacks, especially to children was important to providing good nutrition, supporting lifelong healthy eating habits and helping to prevent costly and potentially disabling diseases such as diabetes and obesity. They also realized that since snacks played a major role in children,s diets. The Best Out of Waste competition held on 24 September 2012 was also a bit hit and brought out the innate creativity of the children leading to holistic learning as underlined by the School ethos. Students of Class 4 & 5 participated in a MOCK INTERVIEW session today to celebrate our Fonder President,s birthday week at Amity International School, Noida. The children dressed up as the Founder President, Dr. Ashok Chauhan ji, the Chairperson Dr.Mrs.Amita Chauhan ji and also as Our Principal Mrs. Renu Singh & our Consultant Amity Schools, Mrs. Roopma Singh. The main agenda was to have the Founder President interviewed by various journalists from different newspaper and T.V channels.